Patrick clowning for the camera. Dive Journal: Linda’s going to lounge on the boat for the second dive, claiming a repeat fit of laziness, so I again buddy with Patrick here at the site called Jeff’s Ladder. Even before we’re in the water we start getting razzed about navigation by the other divers. We descend under the boat and there are lots of sandy patches to explore and hunker down beside. Patrick finds a big grouper and we take some time to video it. Patrick takes control of the video for a while and practices his shooting technique. We swim a long way from the boat but I’m keeping exceptionally good tabs on my navigation. We eventually run into other divers, and one of them mockingly asks me where the boat is, with a big grin. In an exaggerated sarcastic fashion I signal to him that I have no idea, grinning back. Man, they’re not cutting us any slack. After several long ranging explorative routes, we return to the boat each time, although I can tell Patrick is not quite sure I know where I’m going. 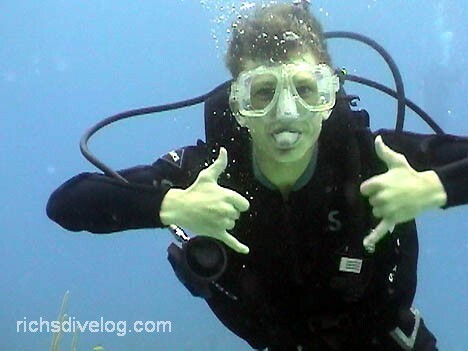 In any case, it is a fun dive and I like diving with Patrick because he’s so enthusiastic. Nearing the dive end, Patrick spies a barracuda next to his dad and videos them together. Back on the boat, we get more wisecrackers congratulating us on finding the boat. It is only then that one diver admits he was seriously asking me directions during the dive – a source of even more laughs. Linda and I are done with our diving for the week, but Janel and John have one more to do. They’ve signed up for the Shark Emporium dive this afternoon, so Linda and I grab 2 cold Kaliks and see them off at the dock. It is a gorgeous afternoon, so we just hang there on the dock, chatting for a long time with Patrick’s dad, working on cold beers, and waiting for the dive boat to return. Seems like a long time, but eventually they all return, still with 10 fingers and 10 toes each! We wonder how it is we can let them go alone on a shark feeding dive! The late afternoon is spent rinsing and lugging dive gear to the room so it can dry. Friday night brings more roudy ping pong matches, and we dive into a few delicious piña coladas too. As is the standard procedure following dinner, Claudia presents departing guests with certificates of diving or snorkeling achievement. When we step forward, the lodge’s applause swells and it makes me happy to know that other guests enjoyed meeting us, too. As I shake Claudia’s hand, someone in the crowd of guests cracks, “Where’s the boat?” followed by plenty of laughs. Small Hope Bay Lodge has turned out to be a great place for us to stay. For starters, it is a very well run operation in all facets, good rooms, excellent eats, and well-oiled dive procedures. Its strength is in its friendliness and in the welcoming nature of its guests and staff. Seemingly in no time, everyone is calling each other by first name and swapping stories. It is common for guests to share hugs when they depart. We will long remember the people we met on this trip. 3/19/2005 – A travel day today - we’re all headed back to Fort Lauderdale. Linda will then fly to Indiana for Great Grandma’s funeral, while Janel, John, and I will head back to Arizona. We pack up all our dive gear, then idle a few morning hours away. Janel and I stroll north on the beach as far as we can go, enjoying the breezes and solitude. Following lunch, we load into the taxi van and return to the airport in just a few minutes. Our charter plane for this leg is quite a bit newer than the last one, and I get to sit in the copilot’s seat this time. Once airborne, we search the island for blue holes and spot quite a few of them, including Captain Bill’s. As we edge out over the western shore, we see that the waters are very calm today with almost no breeze, and the visibility down into the water is phenomenal. You can see every underwater feature and you can almost see individual fishes! We totally enjoy the mesmerizing turquoise waters as we cruise at 2500 feet back over Bimini. The waters then turn to darker blue as the ocean deepens. We eventually reach Florida, and our approach into Fort Lauderdale is simply postcard-gorgeous, skimming over palm trees and private cruisers. We sweep through immigration and customs with barely a wait – flying private charter is by far the best flying experience I’ve had to date. We spend a few hours in the Fort Lauderdale Continental President’s Club, which unfortunately is a relative dump. We’re back being herded around on the dreaded commercial airliners, and accordingly Janel, John and I run into packed and delayed flights. We don’t reach home until well after midnight.